Objective: To evaluate the prevalence of periodontal biotypes in patients with skeletal Class III malocclusion and to explore its association with age, gender, other periodontal clinical parameters and width of keratinized gingiva (WKG). Methods: Data were collected for the buccal-middle site of 310 anterior teeth from 26 subjects who received periodontally accelerated osteogenic orthodontics (PAOO) surgery before orthodontic treatment. Univariate and multivariate analysis were performed to calculate and test the correlations between periodontal biotype and age, gender and bleeding index (BI), gingival recession (GR), plaque index (PLI), probing depth (PD) and WKG. Results: Prevalence of thin periodontal biotype was 33.9% in the anterior region. Mean WKG was 4.37 mm. Univariate analysis showed that a moderately positive correlation was found between WKG and thick biotype (r = 0.544, P < 0.001). A low positive correlation was detected between mandibular teeth and thick biotype (r = 0.387, P < 0.001) and a low negative correlation was detected between GR and thick biotype (r = -0.308, P < 0.001). Multi-level logistic regression showed that biotype was significantly associated with dental arch (odds ratio [OR] = 0.174, P = 0.015) and WKG (OR = 2.043, P = 0.002). No significant associations were detected between biotype and other factors. Conclusion: Dental arch and WKG were associated with periodontal biotype in patients with skeletal Class III malocclusion. Objective: To evaluate the time efficiency and patient preference of three impression techniques by comparing immediate digital impression performed directly after implantation with regular digital impression and conventional implant impression performed 3 months after implantation. Methods: Twenty consecutive patients with a missing single molar or premolar who received implant treatment were recruited into this prospective self-controlled clinical trial. Three different impression techniques were performed after implant surgery on all the participants: An intraoral scanning (IOS) impression performed immediately after implant placement (immediate digital impression) was compared with a regular digital impression and a classic polyether impression (conventional implant impression) performed 3 months after implant surgery. The operating time of each impression technique was recorded. Patients were asked to complete a visual analogue scale (VAS) questionnaire on their perception of the three techniques to describe their satisfaction and preference. Statistical analyses were performed with the Wilcoxon signed rank test. Results: The clinical time of the immediate digital impression (10.97 ± 2.1 min) was significantly shorter than that of the conventional implant impression (14.45 ± 3.0 min) (P < 0.05). The mean time of the immediate digital impression (10.97 ± 2.1 min) was statistically the same as that of the regular digital impression (10.23 ± 2.7 min) (P > 0.05). Participants' subjective evaluation indicated higher satisfaction with the immediate digital impression than with the regular digital impression and the conventional implant impression. Conclusion: The immediate digital impression was more efficient than the conventional implant impression and had the same efficiency as the regular digital impression. Among the three impression techniques, the participants showed higher satisfaction with the immediate digital impression. Objective: To analyse the anterior extension of the maxillary sinus, distribution of the sinus septa and vertical relationship between the maxillary sinus and molar roots using cone beam computed tomography (CBCT). Methods: Imaging data of 970 consecutive patients who underwent CBCT scans were retrospectively collected. The anterior border, septa distribution of the maxillary sinus and relationship between the maxillary sinus and molar roots were analysed. The root-sinus relationship was divided into three types; the roots protruding into the sinus or touching the floor without a bony barrier was defined as Type I root-sinus relationship. Results: Overall, 15.5% of the maxillary sinuses extended beyond the incisor region and 68.9% extended beyond the canine region. A bony septum of ≥ 2 mm was detected in 16.9% (328/1940) of the maxillary sinuses from 26.0% (252/970) of the patients. Among the 355 septa in the 328 sinuses with septa, 108 (30.4%) were located at the first and second premolar region, 180 (50.7%) at the first and second molar region and 67 (18.9%) posterior to the second molar. Among the first molars, a Type I root-sinus relationship was detected in 61.0% of palatine roots, 55.4% of distobuccal (DB) roots, and 52.7% of mesiobuccal (MB) roots. Moreover, among three-rooted second molars, a Type I relationship was detected in 62.0%, 58.2% and 45.8% of MB, DB and palatine roots, respectively. Conclusion: The maxillary sinus can extend beyond the incisor region; approximately 1/6 of sinuses have bony septa; and 1/2 of molar roots protrude into the maxillary sinus or touch the sinus floor without a bony barrier. Objective: To collect information and statistical data regarding the current oral health care and dental education resources in China. Methods: Electronic databases were searched and a literature review conducted. The homepages of relevant universities and colleges were visited to collect dental education information. In addition, private conversations with related experts were conducted. Results: Compared with the 3rd National Oral Health Survey (2005), the ratio of gingival bleeding in individuals aged 33 to 44 years has increased in the last 10 years. The average percentage of residents visiting departments of dentistry in public hospitals is less than 10%. The total number of dentists and assistant dentists increased to 167,227 in 2016, with a ratio of 1.21 per 10,000 people. There is a great imbalance in the distribution of dental practitioners among the provinces. There are 101 dental schools or departments of stomatology that provide 5-year dental training courses and offer bachelor's degrees in dentistry, with another 93 dental institutions offering shorter 3-year training courses for assistant dentists. Conclusion: The results of the present study show that there has been significant change during recent years in China. However, the ratio of dental practitioners to the population as well as the number of dental visits carried out is still much lower than in developed countries and does not satisfy the demand for dental care in China. The quality and quantity of dental education, including continuing dental education, calls for improvement in the future. 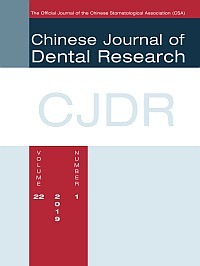 Objective: To evaluate the cost-effectiveness of comprehensive oral health care for severe early childhood caries (S-ECC) in urban Beijing, China. Methods: A randomised cluster sampling method was used to select 187 children aged 3 to 5 years with S-ECC from two kindergartens in urban Beijing. Comprehensive oral health care and questionnaires for the parents/guardians were provided to the test group, while an oral health examination and questionnaires for the parents/guardians were provided to the control group. Data were collected and a Markov model was established for a cost-effectiveness analysis. Results: One year later, 614 RMB yuan and 184 RMB yuan were needed for the control and test group, respectively, to reduce one average decayed tooth. The cost for the test group was continuously lower than for the control group during the 4-year simulation. The cumulative cost for the test group was lower than for the control group when the model was circulated for more than 1.5 years. At this time, the change of decayed teeth was stable in the test group. Conclusion: Comprehensive oral health care had extraordinary cost-effectiveness for S-ECC. The optimal time to process S-ECC may be after 1.5 years. Objective: To investigate the usefulness of diffusion-weighted magnetic resonance imaging (DWI) in odontogenic keratocysts, especially apparent diffusion coefficient (ADC) maps for the characterisation of normal structures and cystic lesions in the jaw. Methods: Sixteen patients who underwent magnetic resonance imaging (MRI) for the diagnosis of a cystic lesion in the jaw were included in this prospective study. DWI was performed on a 1.5 T unit with b factor of 0 and 800 s/mm2, and ADC maps were generated. ADC values were measured for the normal structures in the upper neck area and for the cystic lesion in the jaw. Results: The mean ADC value of the cerebrospinal fluid (3.66 ± 0.47 × 10-3 mm2/s) in the upper neck area was higher than that of the nasal mucosa (1.80 ± 0.19 × 10-3 mm2/s), Waldeyer's ring (0.75 ± 0.11 × 10-3 mm2/s) and the spinal cord (0.71 ± 0.20 × 10-3 mm2/s). The mean ADC value of the five odontogenic keratocysts (1.03 ± 0.31 × 10-3 mm2/s) was lower than that of the one simple bone cyst (2.79 × 10-3 mm2/s), three nasopalatine duct cysts (2.28 ± 0.12 × 10-3 mm2/s), three radicular cysts (1.82 ± 0.71 × 10-3 mm2/s) and four dentigerous cysts (1.67 ± 1.06 × 10-3 mm2/s). Conclusion: This study suggested the usefulness of DWI in odontogenic keratocysts, especially ADC maps for the characterization of normal structures and cystic lesions in the jaw. Objective: To evaluate and compare the efficacy of gentamicin, amoxicillin and metronidazole (GAM) antibiotic paste in noninstrumentation and instrumentation techniques in infected primary molars. Methods: Sixty primary molars in children of 4 to 8 years were selected and divided into four groups: teeth without any periapical or furcation involvement undergoing pulpectomy by noninstrumentation (Group N1) and instrumentation (Group N2) technique using GAM antibiotic paste; teeth with periapical or furcation involvement undergoing pulpectomy by noninstrumentation (Group R1) and instrumentation (Group R2) technique using GAM antibiotic paste. Regular follow-up at 3, 6 and 12 months was carried out for each group and all the clinical and radiographic changes were evaluated statistically using SPSS software. The level of significance was set to P < 0.05. Results: Overall, 73.3% of success was observed in Group N1, 71.4% in Group N2, 86.7% in both Group R1 and Group R2 (P = 0.003). Conclusion: The GAM lesion sterilisation and tissue repair (GAM-LSTR) technique can be an alternative to conventional pulpectomy. A 27-year-old patient with a history of maxillary anterior tooth trauma presented with a maxillary central diastema between tooth- and implant-supported prostheses that had been in use for 5 years. The all-ceramic crowns were placed in 2012 after rigorous occlusal adjustment. Evaluations were carried out at 0, 2, 3, 4 and 5 years post restoration. The central diastema between the natural teeth and the implant-supported prosthesis on teeth 11 and 12 was first observed 2 years after implantation. After 5 years, the distance was found to have increased, with anterior occlusion and esthetic changes having taken place. The following possible causes were discussed: occlusal problems, anterior traumatic effects, the possible impact of guided bone regeneration (GBR) on the adjacent natural teeth and natural movement. More predictive information should be given to patients with implant-supported prostheses and natural teeth so that they are fully informed of the impact of any necessary clinical compromise and are aware of the modifications that may occur to their natural dentition.